THE IMITATION GAME is a compelling and important film - superbly acted - and no doubt championed by Harvey Weinstein for major awards. It tells the story of the English mathematician Alan Turing - a prodigious talent who was instrumental in cracking the German cryptography machine, Enigma, thus shortening World War Two and saving millions of lives. The tragedy of his story is that this socially awkward man lived a life of isolation and worse still secrecy: he was a homosexual at a time when to admit such a thing meant prison and ostracisation. Turing could either work or be honest: an horrific and impossible choice. In the end, when an ungrateful country condemned him for indecency - condemned him to chemical castration, Turing committed suicide. He was only 41. And it was only last year that the government finally apologised. The film of Turing's life could have been suffocatingly pompous and earnest - heavy-handed Oscar bait. But director Morten Tyldum - who made the wonderfully slippery thriller HEADHUNTERS - has crafted a film with a lighter touch. It's elegant, nuanced and humane - allowing the actors to shine. 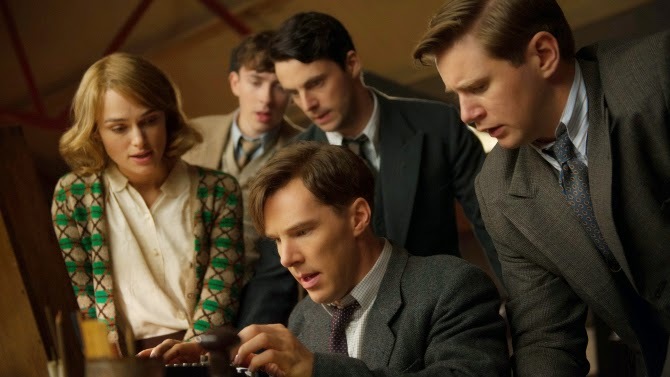 At first I was wary of the film having cast Benedict Cumberbatch as Alan Turing. It felt too close to the Sherlock Holmes character: an arrogant, socially awkward genius. But Turing is an altogether more vulnerable and sympathetic character. For a start, he loves - first his schoolfriend Christopher, and later his colleague the equally talented and wise Joan Clarke (Keira Knightley) - a woman worthy of respect in her own right. Both actors give amazing performances - for Knightley this has to be a career best. But the kid who really steals the show is Alex Lawther who plays the schoolboy Alan Turing. The final scene where he's called into the headmaster's office to hear about the death of Christopher is spectacular, and I hope he's not overlooked come awards season. Behind the lens, Morten Tyldum does, as a good job of weaving together the three timelines - school years, wartime and postwar persecution. But the movie is let down by Graham Moore's script. To be sure, there are very funny zingers - usually given to the suave Mark Strong's MI6 boss Stewart Menzies. But it's also very heavy-handed in places - not least in the repetition of a certain line about outsiders surprising everyone, that he's obviously very proud of and has three characters repeat. It's just groan-worthy. In addition, one can't help but feel that a number of the supporting characters are caricatures - Charles Dance as the mean military commander - Matthew Goode as the resentful but ultimately supportive sidekick - I mean, the movie even has a quasi "I am spartacus" moment! Still for all that, THE IMITATION GAME is a fascinating and moving film. I thoroughly enjoyed it, felt edified, and had a greater respect not just for Turing but Joan Clarke and all those who took on the burden of choosing how much of the Enigma material to use without alerting the Germans to the fact it had been cracked. The movie raises provocative questions of how far people can make judgment - who to let live or die, who to prosecute, who is guilty, who lives. And we need more movies that can both be entertaining AND be profound. THE IMITATION GAME has a running time of 113 minutes. THE IMITATION GAME played Telluride and London 2014 and will be released in the UK on November 14th, the USA on November 21st, Singapore on November 27th, the Czech Republic and Slovakia on December 4th, Romania on December 5th, Norway on December 25th, the Netherlands and New Zealand on January 8th, Sweden on January 16th, Belgium and France on January 28th, Germany and Denmark on February 19th and Japan in March 2015.